Aligned Modern Health at 910 Davis St. The clinic combines chiropractic physical medicine, acupuncture, functional medicine and clinical nutrition to promote holistic wellness. A new integrated healthcare option, providing individualized treatment plans to produce overall wellness, opened its doors in Evanston last month. Aligned Modern Health — which combines chiropractic physical medicine, acupuncture, functional medicine and clinical nutrition — opened up an Evanston clinic at 910 Davis St. in late September. The Evanston location is one of 15 Aligned Modern Health clinics throughout Chicago and its suburbs. “We really wanted to create a place that people could go and get evidence-based outcomes through healthcare,” said Bill Fiely, co-founder and chief marketing officer for the organization. The clinic strives to be “patient-first,” Fiely said, meaning that each individual patient is looked at as a unique case. A holistic medicine approach combines the different core areas of medicine to provide a plan for each patient to achieve wellness in a way specific to the individual’s life. Rather than simply prescribing medicine as treatment, practitioners at Aligned Modern Health work to create a healthcare plan addressing lifestyle adjustments specific to each individual patient, said Ryan Oates, the current clinic manager for the Evanston location. 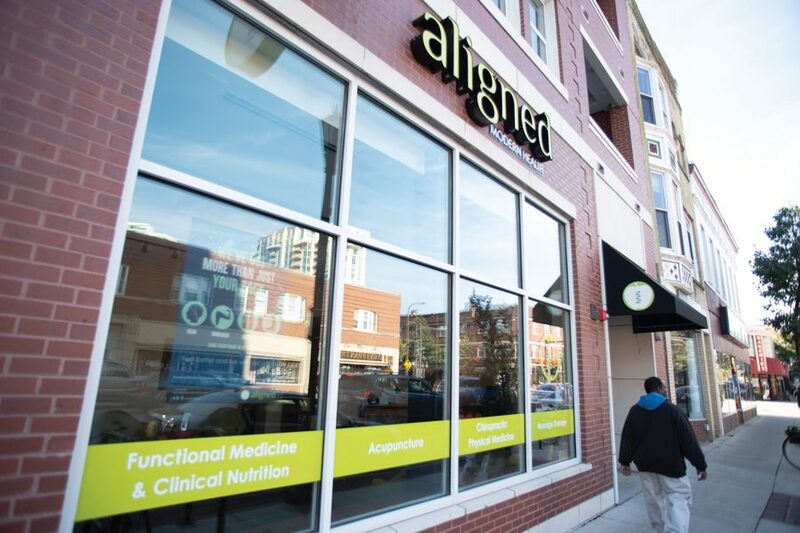 Ever since the first Aligned Modern Health location opened in Wrigleyville in 2010, Fiely said he and the other founders have had ambitions to open a location in Evanston, due to the “tight ties” the founders have to the city. Fiely (Kellogg ’04) and co-founder Andrew Ingley (Kellogg ’03) met at Northwestern University’s Kellogg School of Management. The third co-founder Brian Carey (Weinberg ’97) attended Northwestern for undergraduate studies. The trio became friends through their Northwestern experiences, Fiely said. “Evanston has always been a place near and dear to our hearts, somewhere we wanted to expand and grow,” Fiely said. The idea for Aligned Modern Health arose after each of the founders had found personal relief through alternative medicine treatments, Fiely said. Realizing they had this in common, they decided to found a clinic offering alternative medicine options. Rather than relying on pharmaceutical methods, their treatments rely on non-traditional methods like acupuncture and clinical nutrition. Clients come to Aligned Modern Health seeking relief from a wide range of ailments, ranging from gastrointestinal issues and chronic pain to stress and anxiety, Fiely said. The Evanston clinic has seen a variety of patients, from community members to students, he said. Fiely said Aligned Modern Health is in network with Blue Cross Blue Shield, UnitedHealthcare and Aetna insurances. Students on Northwestern’s insurance plan have Aetna insurance, which requires a referral for chiropractic medicine. Aligned Modern Health is working with student health services on campus to create a collaborative relationship between the organization and Northwestern students. The “holistic framework” of healthcare offered by the clinic helps give residents more choices when it comes to seeking treatment options, said Evonda Thomas-Smith, director of Evanston’s Health and Human Services Department. As an organization, and specifically in the Evanston clinic, Aligned Modern Health creates a culture balancing producing effective treatment plans for patients while having a “laid-back energy,” Oates said.